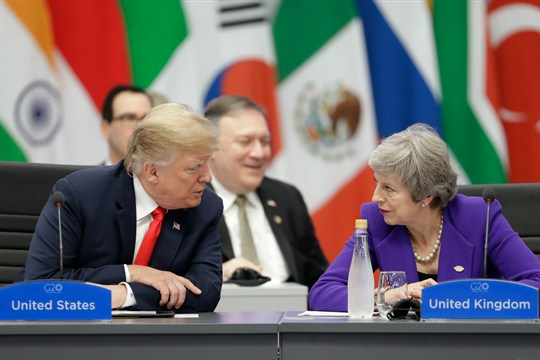 British Prime Minister Theresa May listens to U.S. President Donald Trump during the G-20 summit in Buenos Aires, Argentina, Nov. 30, 2018 (AP photo by Natacha Pisarenko). Today would seem to offer a generous news cycle for a weekly columnist in search of a topic to write about. The New York Times and The Washington Post are back to trading bombshells about Donald Trump, with recent reports that the FBI opened a counterintelligence investigation against Trump in the early months of his presidency because top officials feared he might be compromised or controlled by the Kremlin, and that Trump has gone to great lengths to hide the details of his meetings with Russian President Vladimir Putin from his own administration. Those were soon followed by revelations that Trump periodically but consistently raises his desire to withdraw the U.S. from NATO with aides and advisers.